I have been messing around with Jim Lahey's (of no-knead bread fame) new bread book, "My Bread". 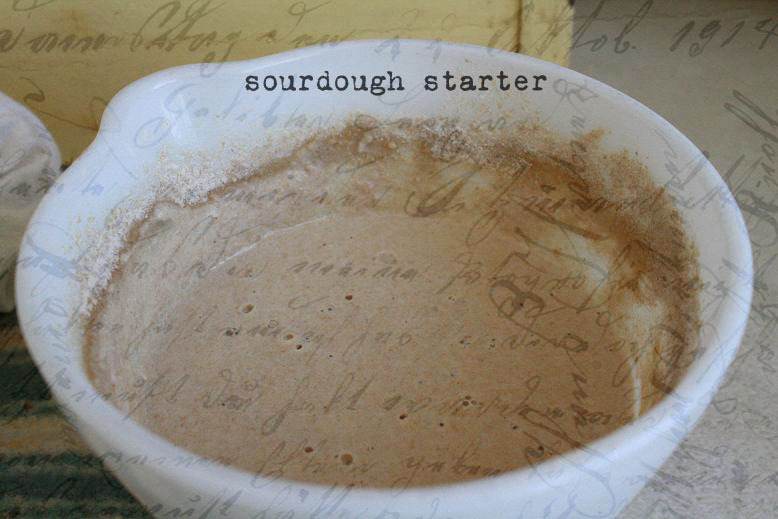 It doesn't have a lot of recipes, per se, but what it does have are recipes I have been using as a springboard to using more sourdough starter. Cause I love the flavor of sourdough. And cause I have a mah-vel-ous sourdough starter sitting on my counter that I have been taking very good care of for a long, long time. If you have ever working with Lahey's no-knead recipe you will find it easy to change it up a bit, as you already know how wet the dough is supposed to be. If you haven't, then I would at least try his basic recipe a couple of times so you get an idea of what it should look like. You can google "New York Times no -knead bread" and you will easily find the recipe. I have been making his bread for several years now, and it is always a big hit. Even better now that I have been replacing the yeast with sourdough starter. Mix all of the above (about 30 seconds) and let sit on the counter for about 2 hours, or until dough has more than doubled in volume. Dough will be fairly wet, but not runny. Using a rubber spatula, remove the dough from the bowl and place onto a floured work surface. Lightly shape into a ball. Let sit another 30 min., covered with a damp kitchen towel. Meanwhile, oil (olive oil) two 13 X 18" rimmed pans. Pre-heat oven to 500 degrees....yes, 500 degrees. Rack should be in the center. Pick up 1/2 of the dough and plop it, floured side down, onto oiled pan. Gently stretch it to pretty much cover the entire pan. Don't worry about bringing the dough up the sides. Not necessary. If the dough sticks to your fingers, lightly oil them and continue. 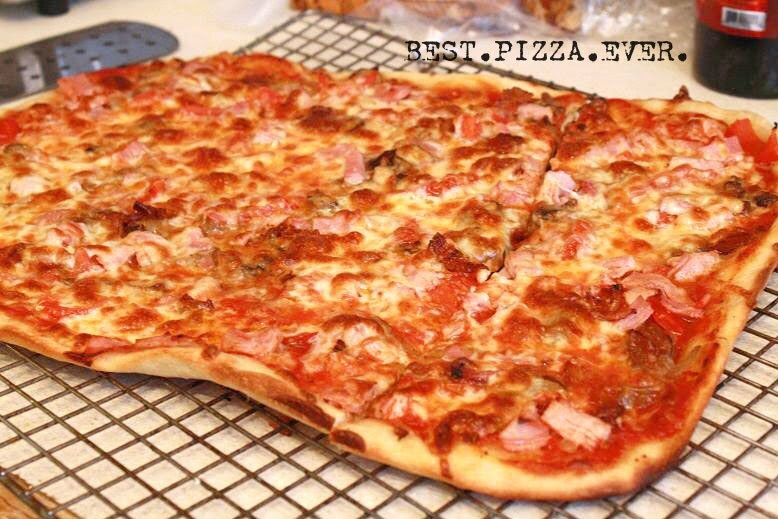 Remember...this is a thin crust pizza! Top with a small amt. of pizza sauce. I use a recipe for homemade sauce I found at Food Network by Tyler Florence. We love it and it's cheap and easy. Too much will make the dough soggy and it will not crisp up well. Add toppings, but be careful not to overdo. Soggy pizza...not so good. I used a jalapeno, finely diced, some thinly sliced onion, several tomatoes that I seeded and cut into small pieces, sliced green olives, and a bit of diced summer sausage. Top with about 8-10 oz. of mozzarella cheese. Or cheese of your choice. Mmm...feta is good! Bake for 15-25 minutes, watching carefully. This is a thin, crispy crust, and it can easily go from lightly browned to crispy burned in a very short amount of time! All of us have agreed that it is the BEST.PIZZA. EVER. to come out of my kitchen. And I have been making pizzas for a very, very long time! Mmmm!!! Sounds delicious. This year I want to learn to make good sourdough. Thanks for the inspiration. I've checked his book out of our library and enjoyed it. I need to make some bread, haven't in a l.o.n.g. while. Many thanks, Cyndy, for your prayers and kind comments; they have meant so much to both Dave and I.
p.s. love the music...LOVE the music! Have you tried the "No Knead" sourdough bread method over at gnowfglins.com? Really cool. I'm bookmarking this recipe. I've got my bubbly sourdough starter sitting on the counter right now. Thanks for the recipe - I'm always after something to use my starter for (besides the bread we make each day). The pizza looks delicious! Oh that does look delicious! If it's the best you've made then it's got to be wonderful indeed!! You are inspiring me to bake!! Just found my way to your blog - love it! And we're almost neighbors. :) I have been scared to try sourdough because it requires a "commitment". Which is kind of silly since I'm home all day, every day and in the kitchen for a good part of that time. But your pizza has inspired me. I'll have to see if I can get some starter going. I definitely need to give this a try! Pizza is a Friday staple at our house and I have a beautiful sourdough starter that doesn't get used as often as it should. Thanks for sharing!